"These new compound-specific isotope measurements confirm earlier interpretations of Neanderthal diets as being composed of mainly large herbivores," researcher Michael P. Richards said. The popular interpretation of the Neanderthal diet has always been meat-centric. But a handful of recent studies have called the assumption into question. Let me guess, the handful of recent studies that called that assumption into question were vegan feminists. 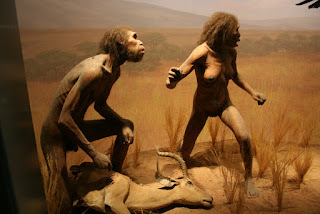 New analysis of the Neanderthal diet by scientists with the Max Planck Institute for Evolutionary Anthropology showed the original interpretation is correct. Neanderthals, researchers confirmed, ate mostly meat. Scientists typically determine a species' tropic level, its position on the food chain, by measuring nitrogen isotope ratios. 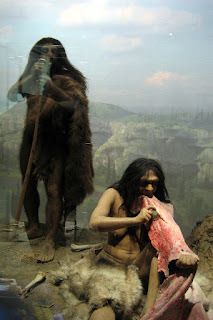 Neanderthals exhibit elevated nitrogen isotope ratios, but some researchers have argued those measurements can be explained by Neanderthals' consumption of mammoth meat or putrid meat. A few studies have argued cannibalism boosted Neanderthals' nitrogen isotope ratios. It OK if they ate each other, as long as the only other thing they ate was fruits and nuts. 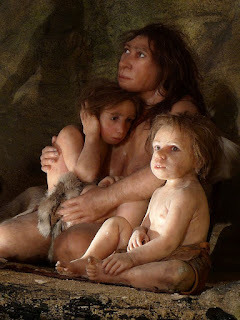 Because many of the bones used to measure Neanderthals' nitrogen isotope ratios have been sourced from infants and juveniles, some scientists have also suggested Neanderthals were late-weaned. Fish consumption, typically thought to be a signature of modern humans, has also been offered as an explanation for Neanderthals' elevated nitrogen isotope ratios. Because so many explanations could in theory explain the elevated ratios, researchers decided to turn a different analysis technique, a novel method called compound-specific isotope analyses, or CSIA. The technique allowed scientists to separately analyze each amino acid in Neanderthal collagen extracted from remains at two French dig sites, Les Cottés and Grotte du Renne. Different amino acid ratios are linked with environmental factors, while others are influenced by food sources. When analyzed separately and collectively, the combination of ratios can reveal are more detailed portrait of Neanderthals' dietary patterns. 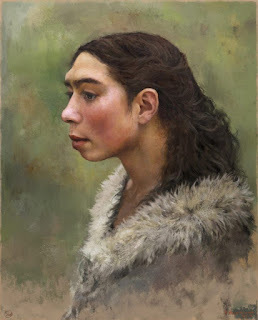 Interestingly, the Neandertals of Les Cottés had no modern human DNA, even though they lived in Europe at the same time. My guess is that modern humans occasionally captured and mated with Neandertals and not vice versa. It was hard to be picky in the Paleolithic. "Using this technique, we discovered that the Neanderthal of Les Cottés had a purely terrestrial carnivore diet: she was not a late weaned child or a regular fish eater, and her people seem to have mostly hunted reindeers and horses," Klervia Jaouen, a researcher at the Max Planck Institute, said in a news release. "We also confirmed that the Grotte du Renne Neandertal was a breastfeeding baby whose mother was a meat eater." The new findings, published this week in the journal Proceedings of the National Academy of Sciences, are in agreement with the archaeological evidence. "There has recently been some frankly bizarre interpretations of the bulk isotope data ranging from Neanderthals primarily subsisting on aquatic plants to eating each other, both in direct contrast to the archaeological evidence," said Michael P. Richards, researcher at Simon Fraser University in Canada. "These new compound-specific isotope measurements confirm earlier interpretations of Neanderthal diets as being composed of mainly large herbivores." I would suggest the scientists proposing bizarre interpretations to support vegetarian diets didn't live at the height of the ice age.